Back in the 1980s, there were a series of games known as the Epyx Sports series, consisting of Summer Games, Winter Games, and World Games. These titles found their way onto various platforms, with some versions being considered alright, while others were a little more… disastrous. Perhaps the most infamous ports of the series were those found on the NES, which are notorious for their poor controls. How bad are the controls in the NES version of World Games? Well, the above usage of the words “poor controls” is probably being generous. Oftentimes, it feels like you have no control whatsoever in World Games. I really wish that were an exaggeration. The concept of World Games is simple enough, it’s just a series of mini-games based on different sporting events from around the world (you even get an “educational” introduction to each game and its cultural significance beforehand). In execution, however, it’s anything but simple. The controls are an absolute mess. At their least-offensive, the controls are easy to figure out, but difficult to actually perform, such as in the Caber Toss event, where you have to repeatedly hit left and right on the D-pad. It sounds simple, but it’s utterly demanding, and moving your thumb from one side of the D-pad to the other over and over again might give you blisters. In the middle of the road are games like the Sumo Wrestling and Weightlifting events, which just feel like button-mashing nonsense. You’ll mash the A and B buttons as well as the D-pad repeatedly. Sometimes you win and sometimes you don’t. I can’t figure them out, but at least something happens if you mash everything enough. Then, at the very bottom of the lot, we have mini-games that seem uncontrollable. The Barrel Jumping and Slalom Skiing just seem out of the player’s control. There are only so many buttons on an NES controller, but it seems like no matter what you do your character doesn’t react. It’s almost as bad as Dark Castle on Sega Genesis. The only redeeming aspect about World Games may be that its status as a two-player title means you can have a couple of minutes having a good laugh seeing who manages to pick up a win out of sheer luck (which is more than you can say about Dark Castle). But the humor to be found in the game’s irony can only go so far. 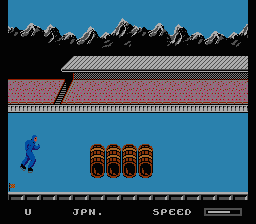 With some of the most abysmal and baffling controls in video game history, World Games on NES serves as little more than a prank to play on your friends. There are a few really bad games on NES. This isn’t the first 1.5 I’ve scored on the system. Although the NES had a lot of classics, its popularity (and lack of competition at the time) meant everyone wanted a piece of the pie. Since this was still relatively early in gaming, a lot of these developers didn’t exactly know what they were doing, and a lot of publishers, who didn’t necessarily understand games at the time, often okay’d a game for release simply because, well, it was a game, so they thought kids would buy it no matter what. Pioneering days of any medium are bound to have some stinkers. Well, you’re not alone. With some of the recent purchases I’ve made, I probably fit in that boat as well. And I have a friend (who lent me this particular game) who can’t seem to get enough of them. If this is anything like Winter Games, I’d imagine your thumb would get pretty sore playing this game. For that matter, you would be lucky if your controller didn’t break.